The HPS Grant Program was started in 2009. 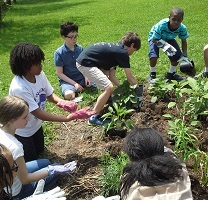 Once a year, HPS/MAG awards grants from $300 up to $1,000 to individuals, community groups, schools, and other organizations in the mid-Atlantic region who are working to promote horticulture and positive ecological impact. Applications due February 1. Below are listed past grant award winners. Awbury Arboretum, Philadelphia, PA received $500 to establish a hedgerow planting for pollinators adjacent to a more formally planted pollinator habitat. Bryn Mawr Rehab Hospital, Malvern, PA received $814 to refurbish and enhance the Enabling Garden for patients recovering from neurological diagnoses. Chester County Learning Center, Coatesville, PA received $500 for plants to complete a project to enhance a public space and water feature at the Learning Center. Delaware Nature Society, Hockessin, DE received $500 to create an educational habitat garden in the Outdoor Classroom at the Dupont Environmental Education Center of the Delaware Nature Society. Long Branch Green Team, Long Branch, NJ received $450 to revitalize and restore a neglected park within the City of Long Branch, Jackson Woods. 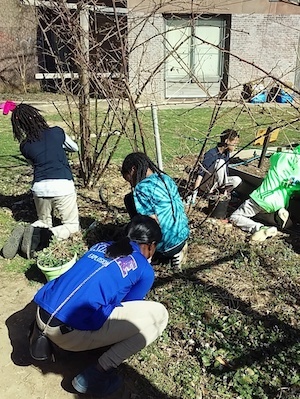 Philadelphia Orchard Project, Philadelphia, PA received $1,000 restore and expand a community orchard in partnership with the Overbrook Environmental Education Center. Riverbend Environmental Education Center, Gladwyne, PA received $700 to carry out a planting project in an area of neglected grassland. Stillwater Township Elementary School, Stillwater, NJ received $500 to design and construct a Monarch Butterfly Waystation and Pollinator Garden as part of an outdoor science lab. 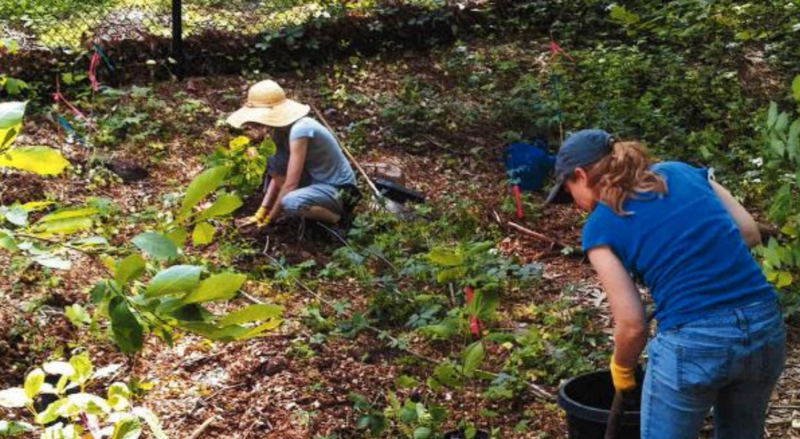 The Friends of High School Park, Elkins Park, PA received $1,000 for the purchase of plants for the maintenance and management of a native ecosystem. 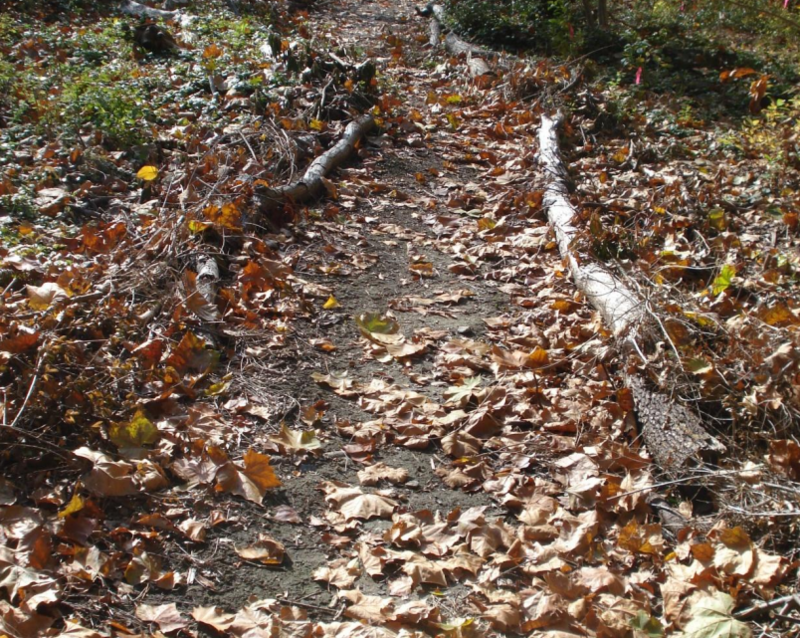 The Miquon School, Conshohocken, PA received $500 for the purchase of plants to improve the woodland campus and prevent erosion on steep slopes in the valley and along the creek bed. The College of Physicians of Philadelphia, Philadelphia, PA received $200 for the purchase of plants to expand the multi-sensory garden. Wyck Association, Philadelphia, PA received $500 for the restoration of a historic rose garden destroyed by disease which was created in 1824. Bryn Mawr Rehab Hospital, Malvern, PA received $350.00 for their horticultural therapy program. Cayuga Lake Watershed Network, Aurora, NY received $350.00 to plant asclepias for butterflies and the control of erosion on the shore of the lake. College of Physicians of Philadelphia, Philadelphia, PA received $400.00 for a program to aid visually impaired individuals to visit the gardens and feel, touch, and learn about the medicinal herbs and other plants. 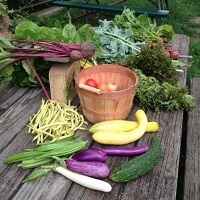 Delaware Center for Horticulture, Wilmington, DE received $350.00 for a garden to grow vegetables and ornamentals in difficult urban conditions. Green Spring Gardens, Alexandria, VA received $300.00 to build a crevice garden to explore easy care gardens for drought tolerant plants. Jenkins Arboretum, Devon, PA received $400.00 to restore browning hillside and control water runoff from housing developments. Master Gardeners of Delaware, Springfield, PA received $250.00 for plants for their urban gardening program in Chester. Melwood Horticultural Training Center, Inc., Upper Marlboro, MD received $300.00 to create a pollinator garden as part of their therapy program for people of differing abilities. St. Peter's Historical Church and School, Philadelphia, PA received $300.00 to plant trees along the pedestrian walkway through the churchyard. Riverbend Environmental Education Center in Gladwyne, PA received $200.00 for wetland plants to increase the diversity of flora and fauna in and around their pond. Stillwater Township Elementary School, Stillwater, NJ was given $200.00 to help construct an outdoor classroom to increase students' knowledge of agricultural practices in conjunction with the school's large vegetable garden program. York Fresh Foods Farms in Red Lion, PA will use their $300.00 grant to to establish a native plant habitat for pollinators. 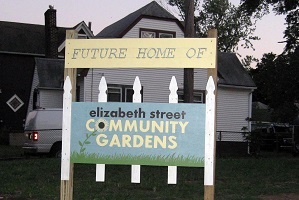 The Philadelphia Orchard Project received $500.00 to plant fruit and nut trees and native plants as part of the Norris Square Neighborhood Project in Philadelphia. Miquon School, 2025 Harts Lane, Conshohocken, PA were awarded $500.00 towards a pollinator garden as part of a project to restore their creek, its banks and the ecological health of the property including replacing invasives with native plants, preventing erosion and controlling runoff all with the very active participation of the students..
C.W Henry School, 601 Carpenter Lane, Philadelphia, PA were awarded $300.00 to go towards a long term project to support an educational program for the benefit of the students and the community. 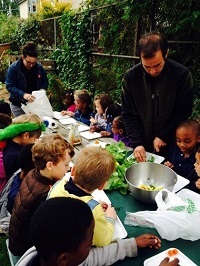 This grant will specifically support garden education lessons led by a Farm Educator while providing fresh produce to students, their families and others in the community including a local shelter. Riverbend Environmental Center, 1950 Spring Mill Road, Gladwyne, PA were awarded $200.00 to help restore the Courtyard Garden, an outdoor educational area, and planting it with native plants which attract pollinators and improve wildlife biodiversity. Riverbend has many programs, mainly for children, and has many visitors. The Courtyard will greet and welcome them all. Stillwater Township Elementary School, 904 Stillwater Road, Stillwater NJ were award $500.00. Stillwater has been working on a schoolyard garden and greenhouse project. Not only is this project a valuable learning experience for the students but for the community which is very supportive of, and active in the effort. Horticultural, agriculture, building and maintenance of structures are all part of the program. There will be an outdoor classroom and a vegetable garden which will be harvested and benefit over one hundred families. Patapsco Valley State Park, Ellicott City, MD, were awarded $500 to establish a pollinator garden to attract bees, butterflies, moths, hummingbirds, and ladybugs, and to help educate the 800,000 annual park visitors about the importance of pollinators to the environment. 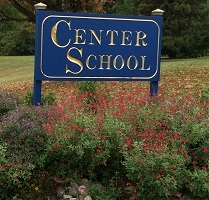 Centreville Elementary School (CES), Centreville, VA, received $500 for outdoor gardens that will be planted and maintained by the students. Each grade level will be assigned a garden space, including raised beds, a greenhouse, a native garden, a butterfly garden, and more. This project will also help the homeless and many families at CES by providing organic produce to help supplement their needs. 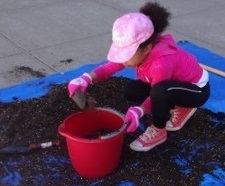 New Voices Middle School, Brooklyn, NY, were awarded a $500 grant to continue their greening work, specifically the care for twenty trees on the block where the school resides, and the expansion of the recently planted butterfly/pollinator garden in the school courtyard. 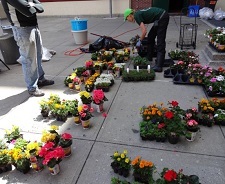 The school's Green Team along with school employees and community members will participate in annual greening events and provide ongoing care of the planting beds. 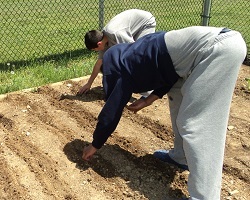 Winthrop High School, Winthrop, Maine, will use the funds to enhance their outdoor student garden, which exposes students to planting, growing, maintaining, and harvesting produce that is used in the school cafeteria. Newlin Grist Mill, Glen Mills, PA, will use their grant money to expand and reconfigure their pollinator garden so it is more accessible to approximately 40,000 visitors each year. 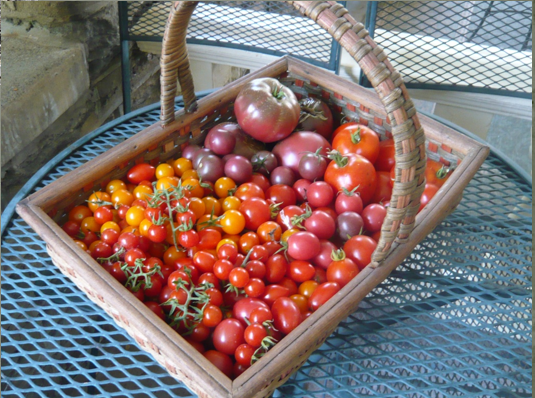 Sandy Ridge Community Garden, Doylestown, PA, will use their grant money to re-establish an organic vegetable garden so they can continue to support local food pantries with nearly 1,200 pounds of produce per year. Riverbend, Gladwyne, PA, a previous award winner and environmental education center in Gladwyne, received $250 to label three native plant gardens to encourage use of native plants in home gardens. 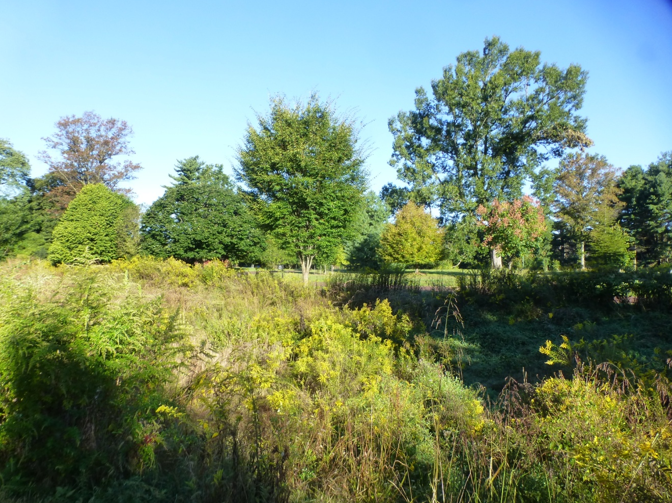 The Jenkins Arboretum, Devon, PA received $500 for expansion and restoration of their conservation woodland project to improve the aesthetics of this location and reduce water run-off. The HMS School for Cerebral Palsy, Philadelphia, PA received $500 to provide gardening experience to students through the construction of raised beds and trellis gardens that are wheelchair accessible. Highlands Historical Society, Fort Washington, received $250 to help preserve and beautify the garden by planting heirloom daffodils in the parterre beds of this historic farm. Boys & Girls Club, Vineland, NJ. 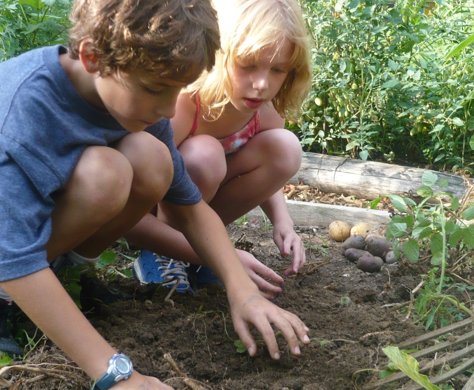 The Boys and Girls Club of Vineland, NJ established the “Project Grow” Community Garden in 2009. Project Grow used the $500 award from HPS to expand the garden by adding more beds, installing more plants, and amending the soil, and a seating area. Historic Fair Hill, Inc, Philadelphia, PA, was awarded $250 to assist with the purchase and installation of a blueberry patch. 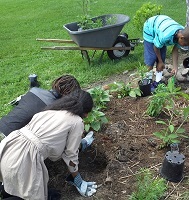 Four Neighborhood Teen Gardeners will work under the supervision of the Garden Manager to provide the planting labor; the income they earn will help them purchase clothing and school supplies. The C. W. Henry School, Philadelphia, PA. 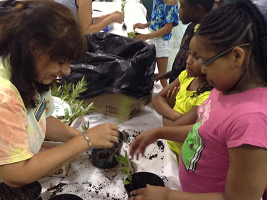 The C. W. Henry School was awarded $250 to assist with the implementation of gardening programs for its 400 students. Through the use of the garden as an outdoor classroom, students will be directly involved in the growing process, learning how to be proactive about healthy nutrition and sustainable growing practices, and enjoying fresh produce. Keyport Garden Club, Keyport, NJ. The Keyport Garden Club was awarded $500 to assist with the establishment of a community garden in Keyport, NJ, a town devastated by Hurricane Sandy. The funds will help the garden club to create an inviting green space, surrounded by a fence that will enclose garden plots for lease by community residents, and include a seed library. Jamison Elementary School, Jamison PA. This grant will enable the students' "Grub Club" to brew batches of compost tea to organically fertilize their 'Garden of Eatin'. Horn Farm Center for Agriculture Education, York, PA. The Horn Farm Center connects at risk youth with agriculture through the process of building and growing a community garden. Historic Fair Hill, Inc., Philadelphia, PA. Bee and butterfly attracting plants will be planted at Historic Fair Hill Burial Ground to aid pollination, support education programs, and provide beauty. PSU Extension, York office / MAEscapes Educational Outreach. The grant will support the Master Gardener work with the Dover Elementary school to plant native shrubs. Ned Wolf Park, Mt. Airy, PA. Funds will be used for the Terrace Wall project which seeks to replace old creosote landscape ties with stone seating walls. C.W. 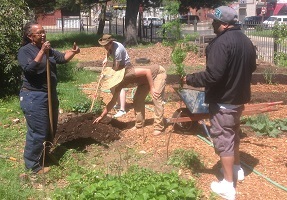 Henry School PTA, Philadelphia, PA. Grant funding will assist with educational gardening programs for kids. Rose Valley Environmental Advisory Council. The HPS grant helped to cover the costs of the native shrubs and forest understory plantings at the Saul Wildlife Sanctuary. Montgomery 4-H Beekeepers Club. 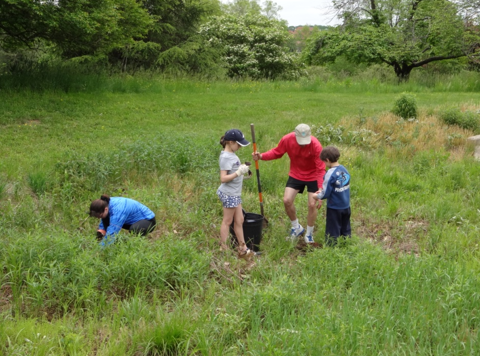 The club selected eight pollinator friendly perennials and planted 500 plugs in a swale in the Morris Arboretum's Pollinator garden. C. W. Henry School, Philadelphia, PA. 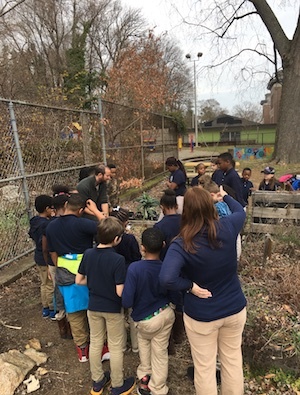 This grant, along with a grant from the First United Methodist Church of Germantown, allowed our farm educator, David Siller, to garden with approximately 230 students. Wissahickon Valley Watershed Association and Center School. 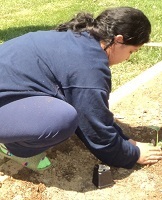 Install a native plant garden on the school campus. Historic Rittenhouse Town, Inc. Streamside stabilization project for Paper Mill Run. Historic Fair Hill Inc. Planted a hillside lawn at the historic burial ground with naturalizing early spring bulbs. 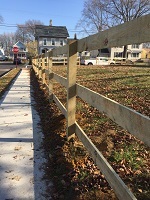 Friends of Linwood Park, Ardmore, PA. HPS contribued $500 for the park's new tree platform. 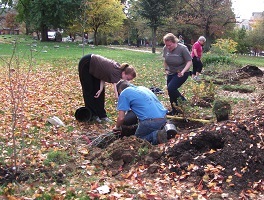 Historic Fair Hill Burial Ground, Philadelphia, PA. HPS funds helped solve a storm water management problem. Riverbend Environmental Education Center, Gladwyne, PA. HPS contributed funds to help builld a native plant garden adjacent to the parking lot. 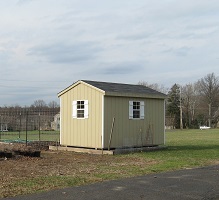 Garrett Hill Community Garden, Radnor, PA. Grant funds were used to build four new raised beds. Permacultivate, Reading, PA. Development of the Canal Street entrance garden for The Reading Roots Urban Farm, which sells fresh produce at a local farmer’s market, allowing low income citizens better access to fresh produce. 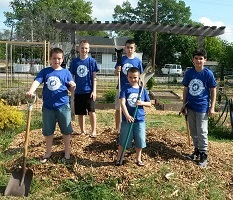 Unitarian Universalist Church of Lancaster, Lancaster, PA. HPS contributed money for plants, rain barrels, and soaker hoses for the Native Rain Garden, a project led by the 5th and 6th Grade Faith Development Class. Garrett Hill Community Garden, Radnor, PA.
Face to Face Soup Kitchen, Germantown, PA. Community Garden. Montgomery County 4-H, Collegeville, PA. Potato Towers. New Jersey Audubon’s Rancocas Nature Center Demonstration Garden. East Passyunk Crossing Civic Association and Town Watch, East Passyunk, PA.
Tyrell Smith. Scholarship to study Landscape Architecture at Albright College. Elwyn Ancillary & Outpatient Therapeutic Services. Children’s Pizza Garden. Wolfsville Elementary School, Myersville, MD. Garden Club for Kids.